Gorgeous vertical lines in this photograph. 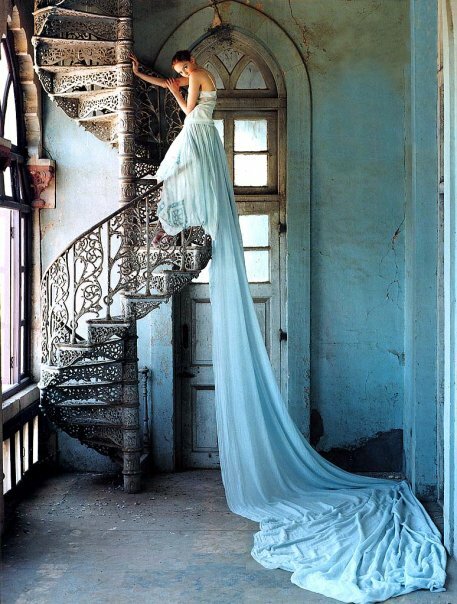 The length of the dress surpasses the length of the winding staircase. It's breathtakingly beautiful. The girl, however, is virtually an accessory in this image of beauty. It's not even her that makes this photograph beautiful. Some people may think this girl looks like a tweaked-out meth addict or a homeless lumberjack, but I think she is beautiful. It looks likes she's been through her fair share of rough times. Be a Part of the "Summer of Dresses"